Laura and I looked at each other, then at our guide, and then back to the 12 foot drop below us. He confirmed this (vertical) plan of action with his usual grin and glint in his eye. By this point, we were already halfway through the Dades Gorge, and there was no turning back from this one. 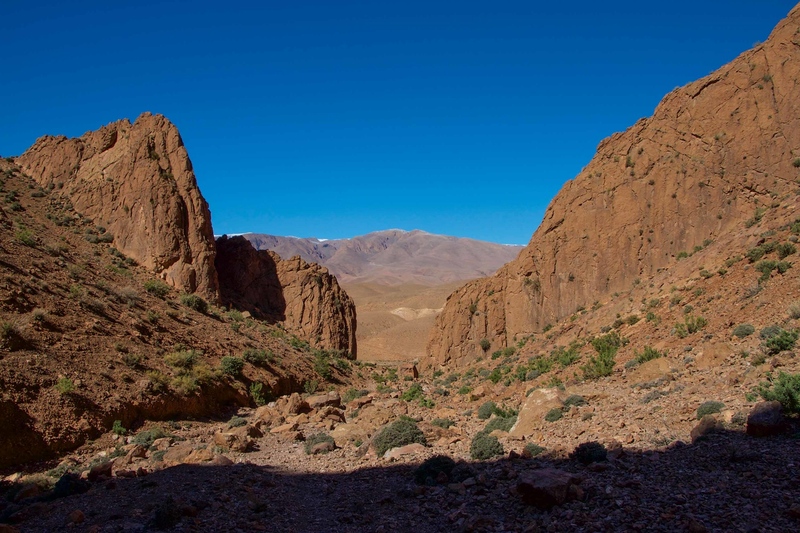 As with most of our adventures in Morocco, from trekking Mount Toubkal in winter, to getting caught in a Saharan sandstorm, once we were presented with the situation, our only option was to embrace it and deal with it. Morocco once again delivered on a great adventure! The Dades Gorge is spectacular. As you move through it, the gorge narrows and widens, as if it were inhaling and exhaling around you. The colours you will see are out of this world, deep oranges and yellows flowing into purples, reds and blues, all set below deep blue skies. 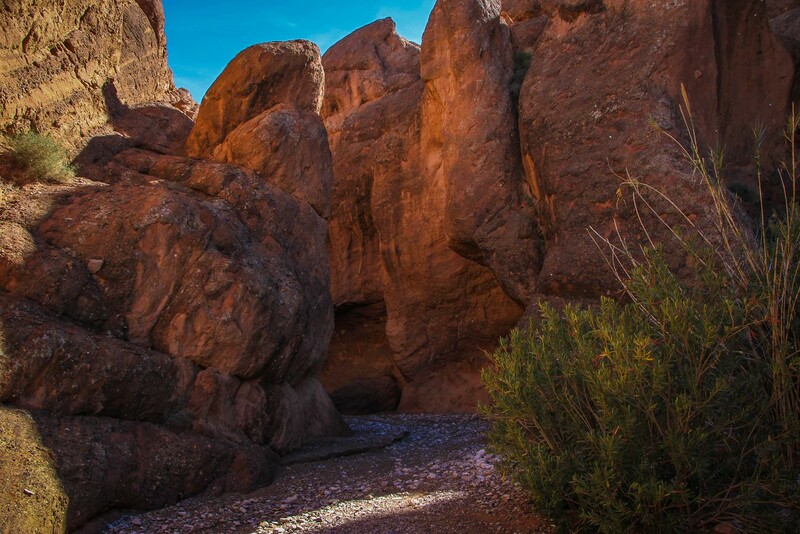 We were blown away by what we saw, it is easily one of the best one day hikes we’ve done in all our travels. As with most of our travels in Morocco, our timing with regards to the weather provided some unique challenges, especially given the torrential rainfall that fell the day before. 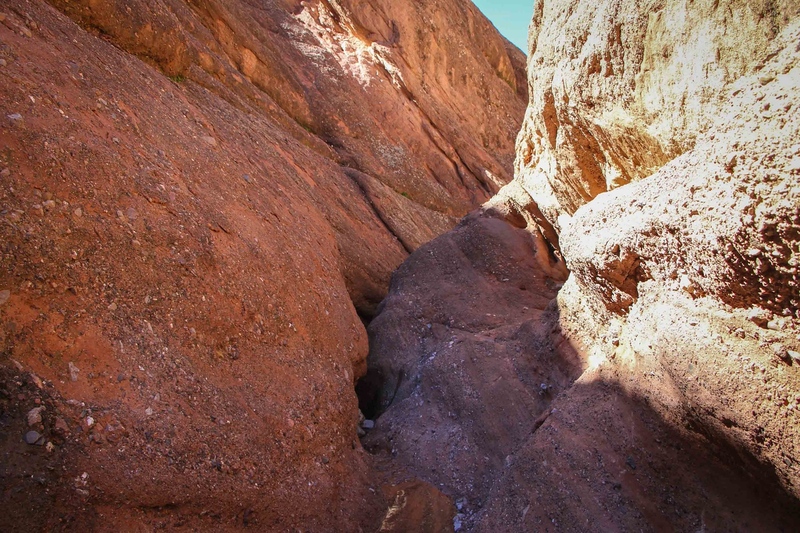 Much of the very narrow gorge was still flooded, sometimes waist deep, which meant the only way to successfully navigate the gorge was to scale the walls and clamber over it, something we didn’t realise until it was too late to back out. We’d arrived a day earlier into Boulemane Dades to torrential rain and flash floods down the sides of the valley. A combination of intense rainfall and snow melt meant most of the roads to our guest house were now criss-crossed by gushing torrents of water. And here we were navigating them in a 30 year old minivan with an engine way passed its retirement age. Laura got the short straw, and was perched in the back of the van on a makeshift seat, the angle such that she was practically lying down as we navigated the treacherous conditions. If that wasn’t bad enough, the minivan was far from waterproof, Laura also taking an impromptu shower in the back of the Morocco mobile. The journey however, was spectacular, and we went back to see it again a few days later when the weather had improved. Up ahead, the road had been washed over with thousands of small stones from the valley above, and a group of local boys were clearing the stones for passing cars. As we reached the clear part of the road, we realised this was entrepreneurship at its finest. They were charging cars to pass through their cleared part of road! We laughed, and happily slipped them a few Dirham as thanks for clearing the road. The next morning couldn’t have been more different, once again our timing was impeccable (read: pure luck). 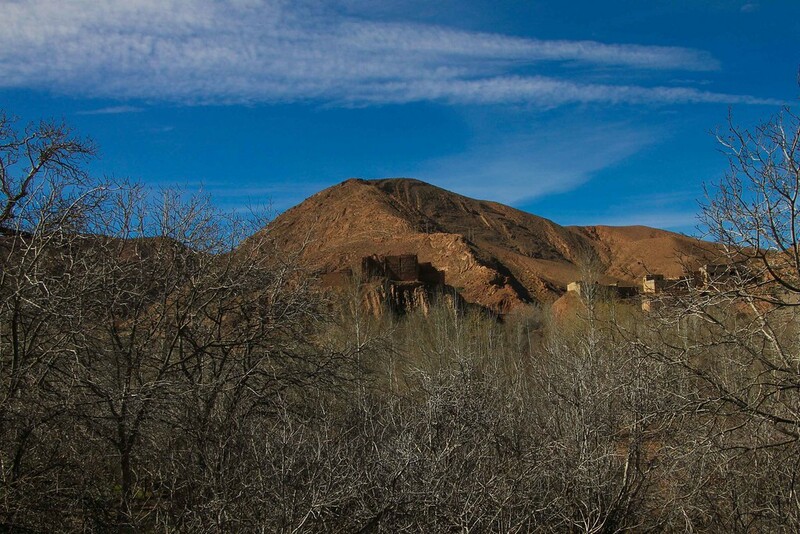 Our guesthouse owner made a couple of calls, and we were clear to enter the Dades Gorge to trek it that day. 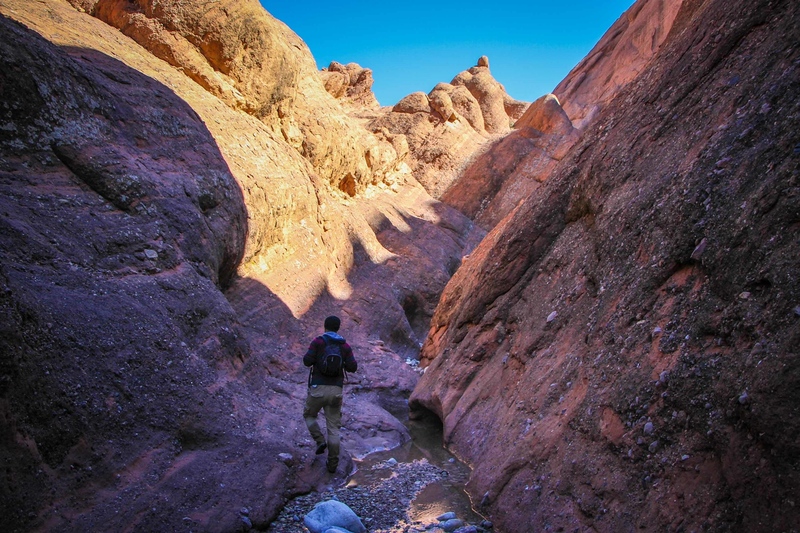 What followed was one of the most interesting and beautiful day hikes we’ve ever been on, some of the colours in the sky and the rocks blew us away, even if we did have to navigate some treacherous parts of the flooded valley. The trek begins in a tranquil and relaxed manner, walking through lush green forests alongside flowing streams and rivers, as locals went about their daily activities. 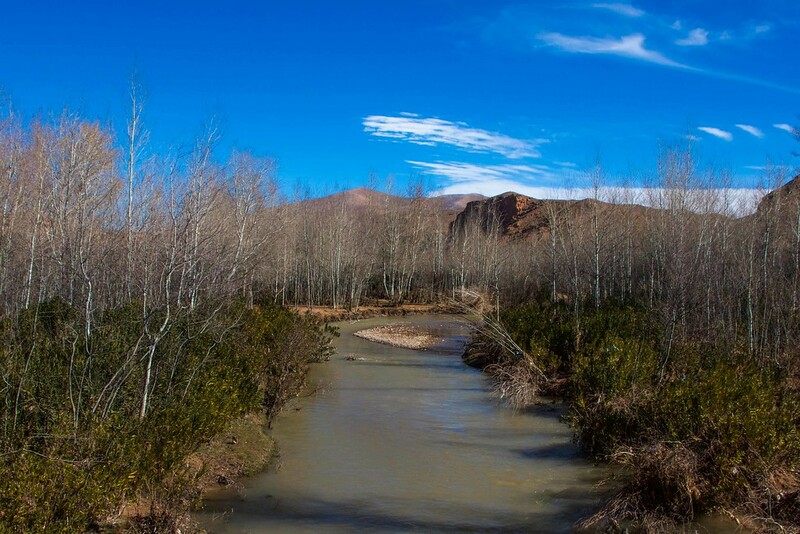 It reminded us again of the diversity of landscapes in Morocco. After an hour or so, we reached the entrance to Dades Gorge. Things were about to get interesting! The sweeping wide and lush green landscapes we’d grown accustomed to gave way to barren red and orange rocks and narrow gaps which we would traverse for the next couple of hours. Clambering through the gorge was so exciting, we were like two kids in an enormous playground. The path narrowed and widened, sometimes we would walk along the sides of the gorge as it gently sloped upwards. As we ventured further in, the remnants of the flash floods from the day remained, and some of the gorge was inaccessible utilising the usual routes. Not that this bothered our trusty guide, he had an answer for everything, which mostly involved scaling up the sides of the gorge and back down again. And so here we were, peering down this gap in front of us. Our guide was adamant that the only option was to somehow get down through this narrow pass and back to the valley floor. 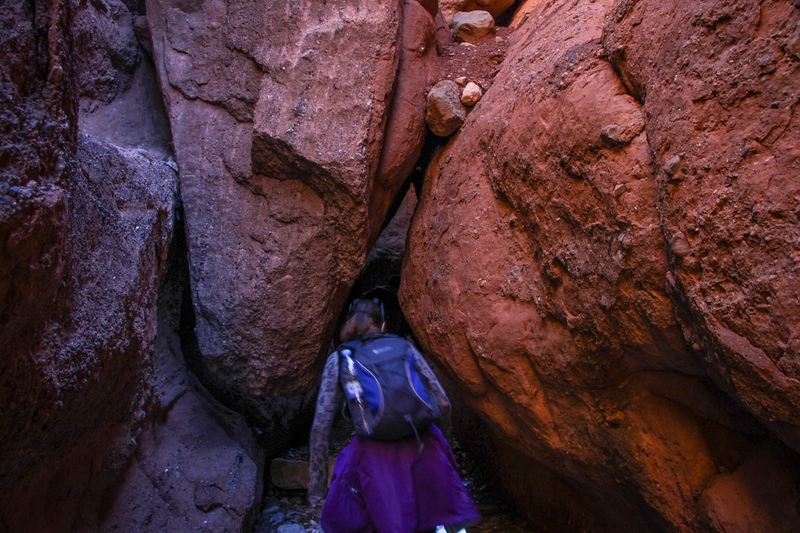 It was clear to our amateur gorge scaling minds that there were no footholds that we would be able to use to get down. How wrong we were. All of a sudden, our guide began to clamber into the gap below us, we guessed to show us how to scale the wall, but he stopped about halfway down and motioned for Laura to step forward. Considering he didn’t speak any English and us no Moroccan, he gestured that the method here would be for Laura to stand ON HIS FOOT which was lodged against the side of the gorge wall. Imagine that? A 10 foot almost vertical side, and a guide standing across the divide halfway down, holding himself there, and expecting to hold the weight of Laura, and myself, on his foot as we made our way down. We were not convinced, but at this point we didn’t really have a choice. Laura was first to go, carefully slipping herself halfway down the gap until her foot came to rest on his. He stood firm, and she was now halfway down the gap. All it took was a simple (!) five foot jump onto the valley floor and she was down! My turn. Again I carefully slipped myself down the side of the rock face, until I tentatively rested my foot on his. Worried about my weight on his foot, I quickly launched myself off of him and down onto the valley floor. We were down! From then on in, it was easy. We took our time, and we genuinely marvelled at some of the places we came across. The rock formations and colours were truly mesmerising and beautiful, and we could easily saunter through the gorge at our own pace, soaking it all up. A couple of hours later, we finally clambered out of the other side of the gorge, invigorated by our experience. 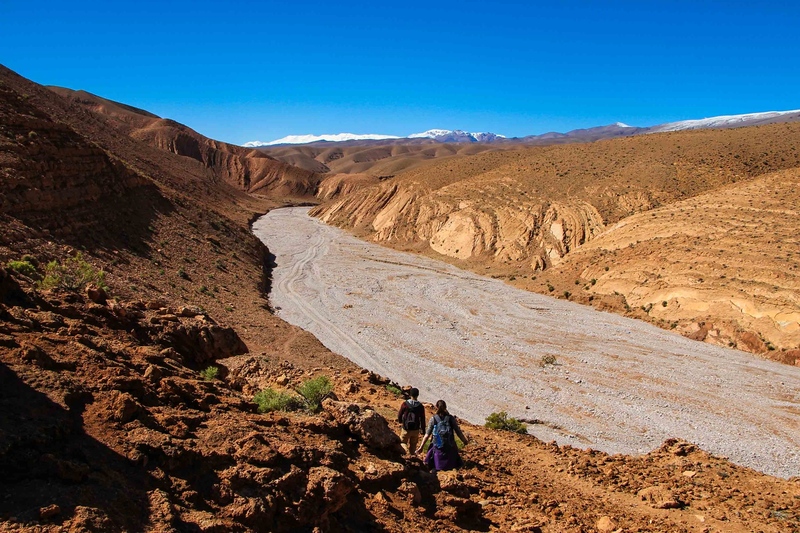 From then on in, we trekked through dried out river beds and sweeping landscapes, a majestic part of Morocco and a place we would love to return to explore further! 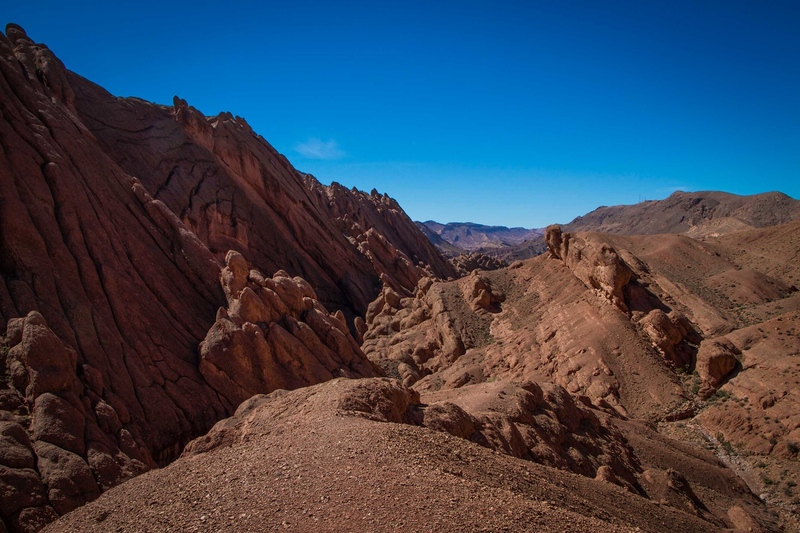 The trek through the Dades Gorge is spectacular, and for a day we could escape everything and appreciate some of the most incredible and beautiful scenery in all of our travels. 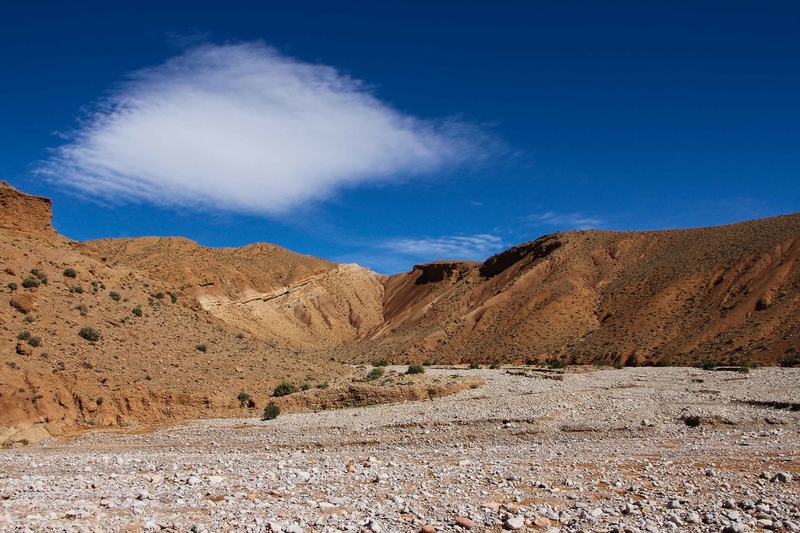 The Dades Gorge isn’t a famous landmark, which was clear to us given we only met two other people all day. 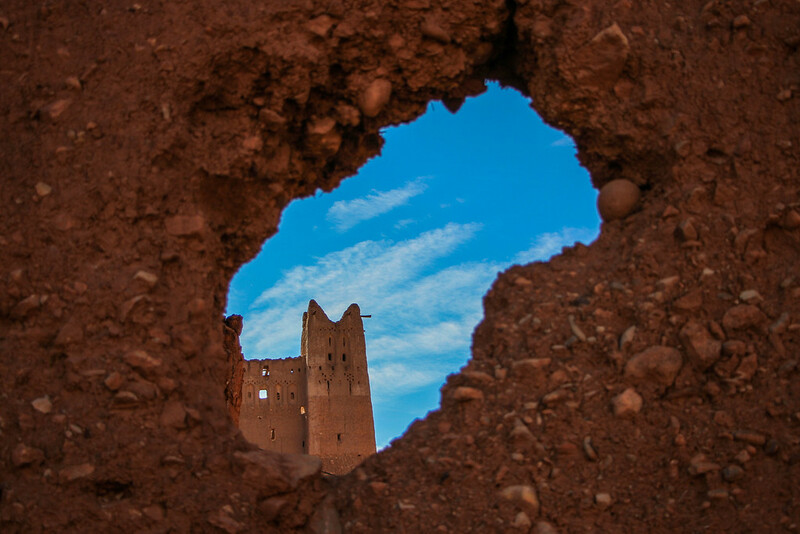 It was truly a chance to clear our minds and appreciate how happy we were to have experienced such incredible sights in Morocco. We arrived back to our guest house with smiles on our faces and memories of a beautiful part of the world, untouched and undeveloped, as it had been for hundreds of years. 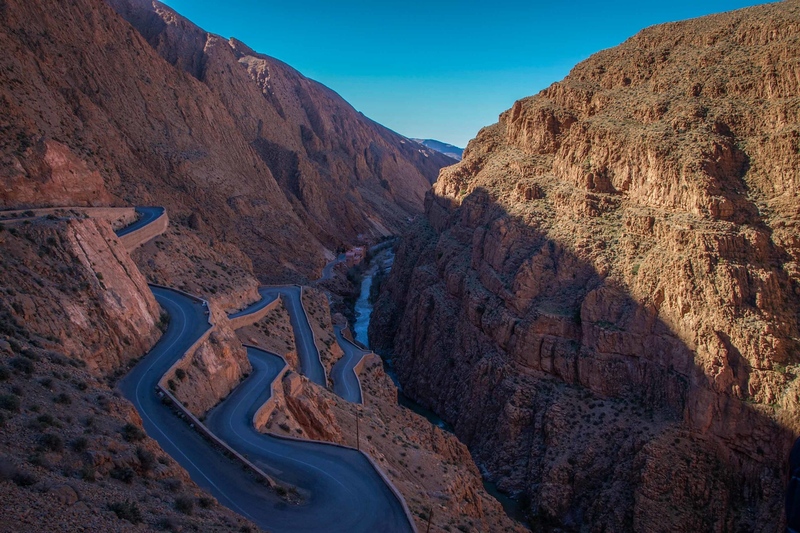 The Dades Gorge is not to be missed on a Moroccan adventure. 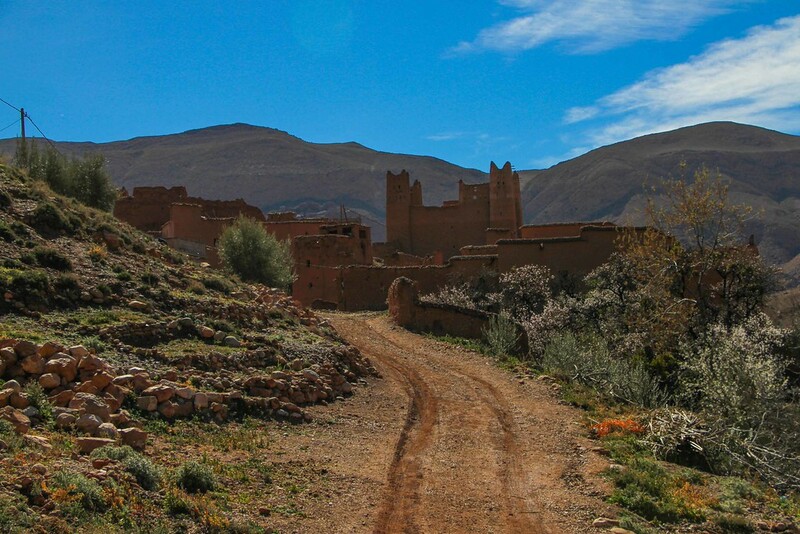 Looking for more Morocco inspiration? Click here. 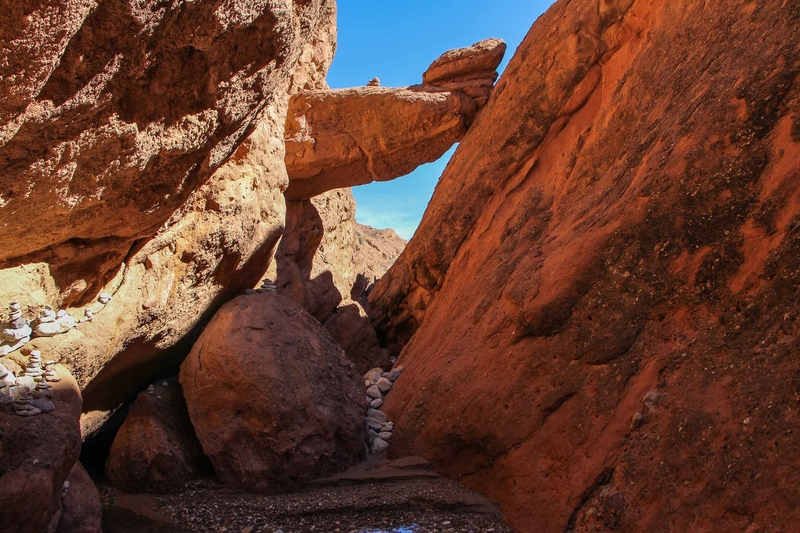 I totally loved the photos – I would love to trek these gorges. Too beautiful ! Thanks Shruti, we were blown away by it – totally unexpected!!! Hi Margot, our guide was arranged through our accommodation (‘Auberge Chez Pierre’) so unfortunately we don’t have a separate note of his details to pass on…sorry can’t be any more helpful! 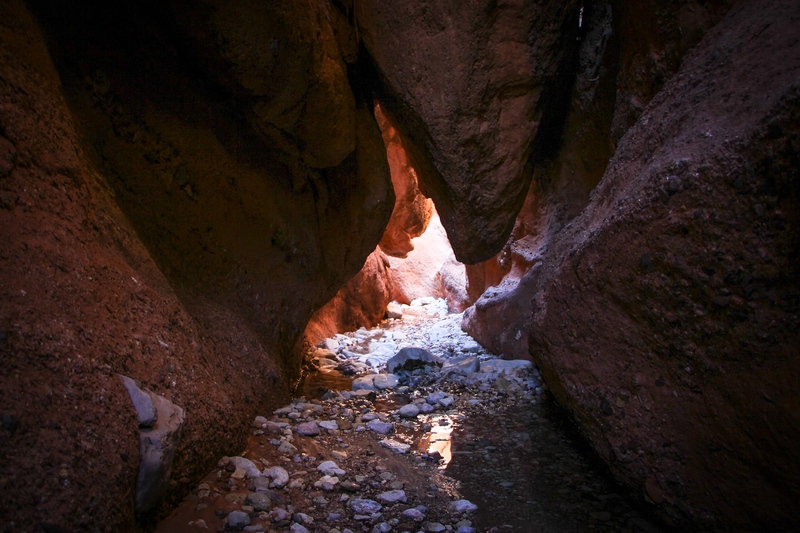 Hope you have a great time and enjoy your hike through the gorge too! I love the way this is written, makes me wanna get up, take a plane and go there to just discover the world, eventhough I have already been there! Nature untouched is the most fascinating. Keep up the writing!